A good night sleep is essential to a well-grounded productive day. It resets your body processes and restores body and mind. Practicing a short – or extended – yoga routine specifically designed to relax your nervous system and calm your energies is the perfect way to transition out of the rush and exhaustion of the day and into a restorative sleep. I began a nighttime yoga routine during my last health challenge, and the results were amazing. I slept like a rock that night. Every night that I practice the poses, I sleep deeply and wake restored. Even when a little munchkin wakes me during the night. They key is to practice poses that you feel comfortable with and that help release tension. If you are hurting, angry, and cursing, move on to a new pose. My husband gets unreasonably angry when he practices yoga – don’t ask, I couldn’t explain it if I tried – but finds that he can practice a couple of restorative poses before bed with good results. We have also been working with my 4 year old. She finds it fun, and I find it to be good practice for the future. A good night’s sleep is essential to keeping my adrenal glands functioning properly. I recently went through the process of healing them, and I never want to go back to that prolonged dragging listlessness again. 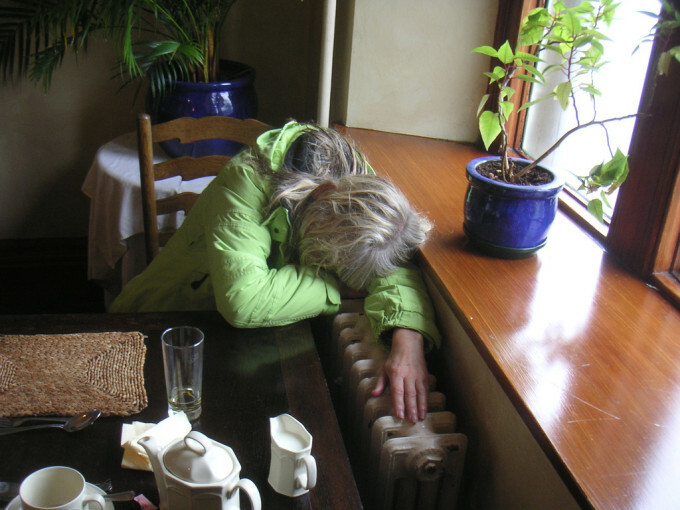 Adrenal fatigue affects many people and can massively impair energy production. If you need coffee get your day started or sugar and caffeine to keep you going through the day, your adrenal glands are likely malfunctioning. An energy burst around 8 or 9 pm is also a good indicator. This cortisol surge gives a burst of energy that often lasts into the wee hours of the morning before you can drift off to sleep. Once you are heavily asleep and your body is attempting to catch up, the alarm wrenches you back to reality. Another day begins as your drag yourself out of bed and stumble off to the coffee pot. A full night’s sleep that starts before 11 pm is essential to getting your body back on track. I will cover adrenal fatigue and healing at some time in the future. It is a massive topic and will require a series of posts. After practicing yoga poses for some time, I have found a combination that allows me to relax deeply and enjoy the process. As a disclaimer, I am not a yogi nor even very flexible. I can’t even touch my toes. Yoga is definitely a relaxation tool for beginners as well as those more advanced. It only requires some dedication to learn the process, a random assortment of pillows for support, and a chance to allow your body to get familiar with the restful routine. Give it a week and see if you notice a difference. If it helps, start with a warm shower or detox bath to begin the relaxation process and warm up your muscles. You will find full routines and the following poses explained with pictures here and here. I hope these help you get some much needed sleep as well as they do for me. If you have any poses you prefer or a good addition to a bedtime routine, add them in the comments! This post is part of GAPS Friendly Fridays, Thank Your Body Thursday.